India’s largest crowdfunding site. Over Rs.545.52 Crores raised. Thats My Child is a NGO which believes every child has the right to education. We are committed to provide the right education to the less privileged children from around the state. We lead a number of campaigns and education programs to give children a better education and future. 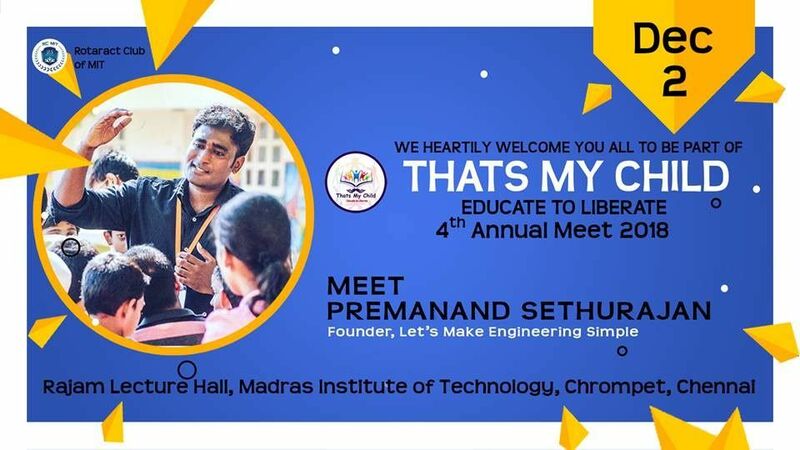 Thats My Child is happy to introduce our new campaign VINNAI THODALAAM in collaboration with Lets Make Engineering Simple team (LMES). Education is not something scary as most of the students think nowadays. 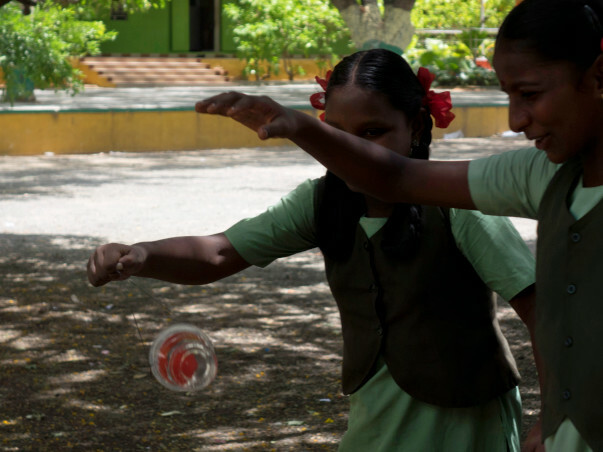 VINNAI THODALAAM is one such campaign that will help children find a new meaning in education. Students learn best when they involve completely in learning, which just a theoretical classroom session fail to provide most of the time. 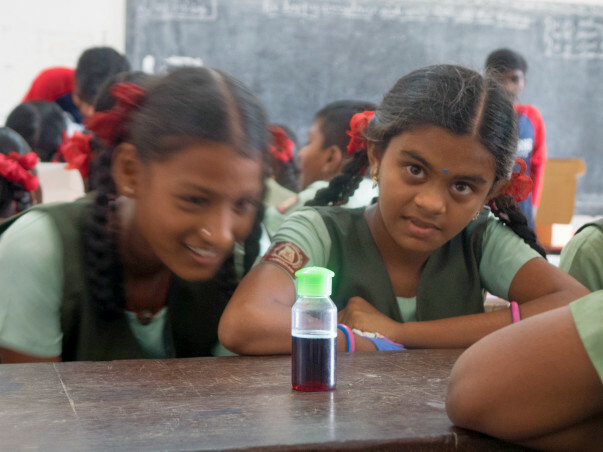 Our aim is to provide hands-on approach in learning science with practical experiments. In this way, we rekindle the interests of students and help them get a chance to ask questions, involve in discussion enhancing their critical thinking ability. When we answer all those questions that students ask through experimental teaching, it can never go off their mind and stays there fresh always. We initially start our campaign from the government and government-aided schools by selecting 30 to 50 deserving candidates giving equal opportunity to boys and girls. Our volunteers along with the team of Lets Make Engineering Simple (LMES) will spend two days every month throughout a year with these students. 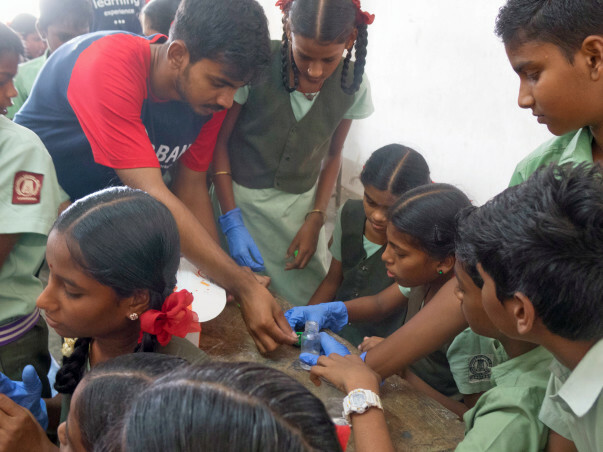 Apart from conducting experiments on those days, we provide food for students and volunteers as well. This campaign is just a beginning and we have a long way to go which is definitely possible when each one of us join hands and take an oath to help children around us receive the best in education. 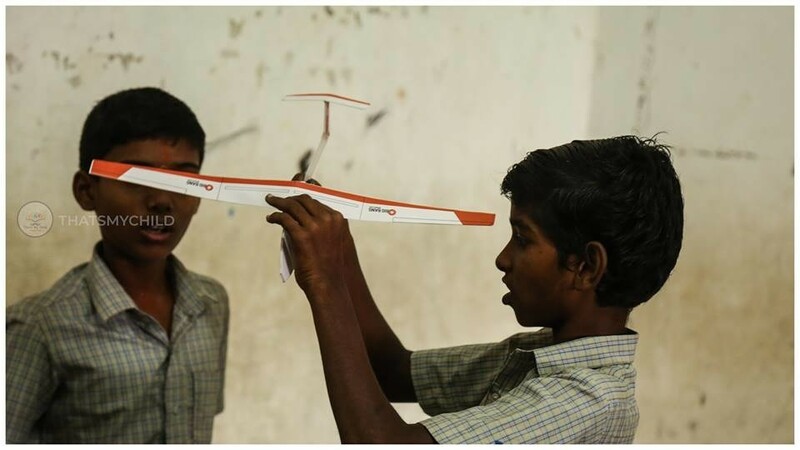 Right now we planned to conduct the one year (June 2018 to April 2019) workshop in Jaigopal Garodia National Higher secondary school, Tambaram. Also many students are ready to participate to in summer camp and English class if it's available almost 20 are sure on they would come if it's immediately after their school closes for vacation. We started the class by explaining how a fan regulator and volume regulator works leading it to potentiometer concepts. We are really amazed to see kids guessing out concepts from the basics that we taught in before classes. From day one kids have improved exponentially , day one had 1-2 scientific terms in class whereas now their usual conversation itself involve a lot of terms. The second half of the class was again display of projects where we were amazed as the students incorporated regulator that was performed in that day class in their project within the recess. We as tutors see a tremendous difference in them. Today we tried a new teaching method called the sticky note method where sticky notes with all information about that experiment was stuck on the board. It was a experimental step for teaching if students would be able to do self learning in future they did great in that. Sticky note method was used to study about pumps. The next half of the class was about areas and perimeters where students where asked to knit shapes in the cardboard and was taught to find the areas of random shapes by breaking into simpler shapes. It was one good class yesterday. Date : 03/01/2019Start of the year 2019😁All happy faces with fresh minds for the new beginnings. New beginnings mark for something new and different so it was mathematics this time😍 We taught them how the value of pi(3.14) evolved, significance of pi was noted when the students did the experiment themselves, various other topics were covered. This gave the students a new perspective of seeing mathematics. A mathematical instrument was introduced called pantograph which helps in scaling down and scaling up things. Ratios were taught using pantograph. It was fun seeing students to write their names small and pantograph would write it big for them. Look at the the image to see what few of them wrote. 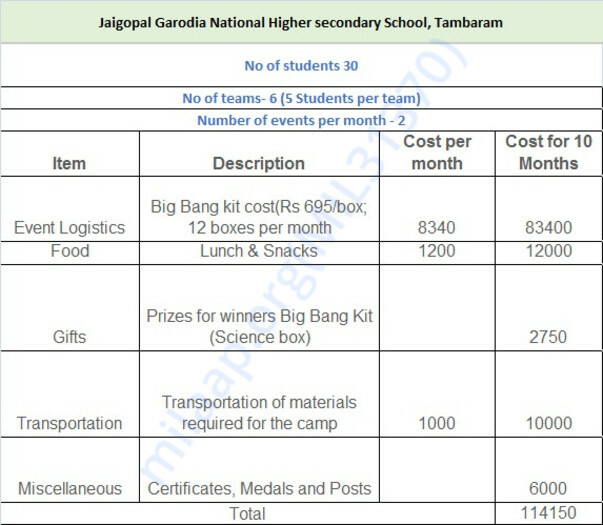 Dear Donors /Well wishers We are sure that we were able to create a change in the way the students think and approach the things around them .We thank you for your generous support ,We have attached the invoice /cheque payment details made to LMES team for all the Bigbang kit which we have provided to students during the classroom experiment session . We are very grateful for all the donations .And we have a meeting with students , Chiefguests on 2 Dec in Rajam Lecture Hall ,Madras Institute of Technology ,Chromepet ,Chennai . And we cordially invite you all to attend the same.